Chinese medicine, just like Western medicine, is a broad field. Working in private practice, I see a multitude of patients with various issues and constitutions and engage with them on a few levels: as a doctor recommending lab tests and supplements, as an herbalist finding the right herbal combination that treats symptoms and roots of the issue, as a bodyworker putting my hands on patients and helping muscles and minds deeply relax, as an acupuncturist choosing the right point combinations, and as a nutritionist recommending specific dietary changes for optimal health. Helping people heal is my passion and often serious work, but lately I’ve been having a little extra fun because I bought a treat the last time I got needles: Swarovski crystal 24k gold ear seeds. 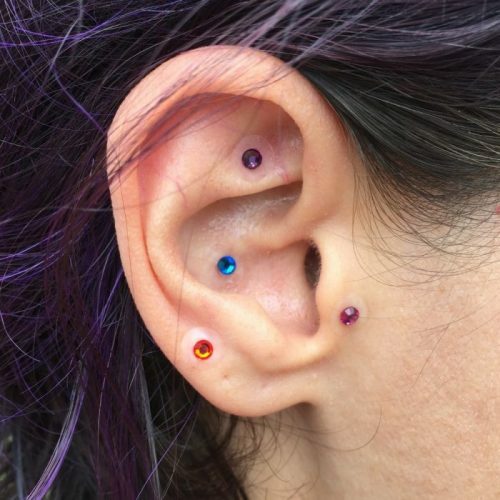 Ear acupuncture is a powerful tool and continuing the treatment by sending patients home with colorful seeds to stimulate the points helps extend the treatment. I often send patients home with vaccaria seeds attached to the ear with a little bit of sticky tape so they can stimulate ear acupressure points themselves at home. There is no skin penetration, but the tiny seeds give quite potent acupressure. Ear acupressure and acupuncture is a system of diagnosis and treatment that connects the sensory cortex of the brain to the ear. Although acupuncture originated through Chinese medicine and has always included points on the ear, the specialty of ear acupuncture was developed by a French neurologist Paul Nogier in the 1950s and was popularized in Europe. Nogier developed the theory of the homunculus, a map of the body in the form of an inverted fetus within the ear. Nogier’s theory used the ear to recognize integrated communication between the left and right hemispheres of the brain, to treat neurological and muscuolosketal imbalances, and to recognize blockages to treatment by identifying discolorations or scar tissue on the ears. The ear holds all the acupuncture points of the body plus specific points for alleviating pain and other symptoms. Trained acupuncturists are able to look at the ear and understand certain conditions and pains of the body. Current research has suggested a connection between the vagus nerve and ear acupuncture. The vagus nerve has a strong link to the parasympathetic nervous system of the heart and digestive tract. The parasympathetic nervous system is the antidote to the sympathetic nervous system, the activator for the flight or flight response. The parasympathetic system is also called the “rest and digest” effect. When the ear seed is located on the appropriate point, stimulating the parasympathetic system can help deactivate the stress response, put the brakes on a binge or addictive behavior, or alleviate a pain sensation. Ear acupuncture lends itself to group settings and is used as a protocol in prisons, addiction treatment centers VA hospitals to treat anxiety and addiction. Here’s a little video about ear acupuncture from the Dr. Oz show if you’re interested in watching how it’s done. Gori, L. & Firenzuoli. (2007) Ear acupuncture in European traditional medicine. Evidence-Based Complementary and Alternative Medicine, 4 (1), 13-16.